older Australians’ experiences of age discrimination. Younger respondents (under 30 years) are generally more negative about the concept of ageing. These participants are less able to articulate specific concerns and more likely to simply be concerned about the broader issues associated with health, welfare, financial stability and housing access. Their views are more likely to be linked to the concept of loss associated with ageing (loss of health, loss of hearing, loss of mental capacity, loss of income). Members of this group find it extremely difficult to identify any benefits associated with ageing and many indicated it is simply not something they have given much thought to at this point in their lives. All respondents were asked to indicate how old someone of ‘old age’ was and to indicate how old an ‘elderly’ Australian was. 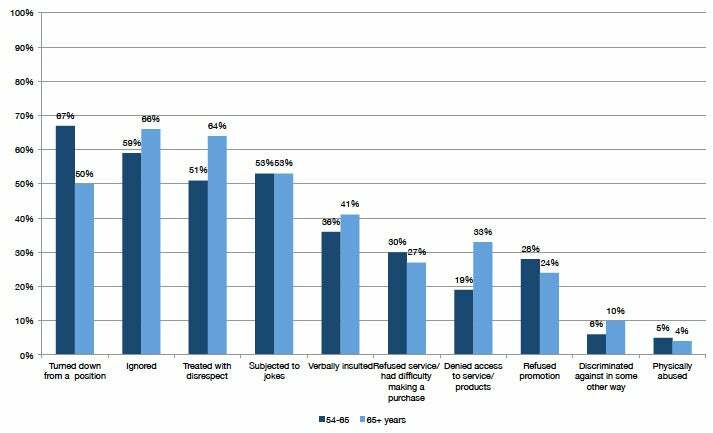 There is little difference in the perception of old age between community and business respondents, reporting a mean age of 61.7 and 62.5 respectively. Perceptions of the age of an ‘elderly’ Australian are also similar, reporting a mean of 70.5 at a national community level and a mean of 72 years in the business sample. There are differences in perception between younger and older participants. Within the community sample, the mean age of ‘old age’ for respondents aged 18-24 years is 55.9 years, compared to 66.9 years for respondents aged 65+ years – a difference in perception of more than 10 years. The differences between age cohorts are similar when the concept of being ‘elderly’ is discussed. Younger respondents (those aged 18-24 years) indicate that an ‘elderly’ Australian is someone aged 66.7 years while those aged 65+ years indicate that an ‘elderly’ Australian is 74.4 years. The average age of ‘old age’ is higher for females (62 years) when compared to males (61 years). Personal experience also has a major impact. Respondents who have a relationship with an older person have a higher average age for ‘old age’ when compared to respondents who have no relationship with an older person (60.7 compared to 56.6 years). There is also a notable difference in mean age between Indigenous and non-Indigenous respondents. ‘Old age’ is seen to be much higher among non-Indigenous respondents (61.6 years) compared to Indigenous respondents (56.7 years). Similar differences are observed in relation to the concept of ‘elderly’. Question: We often hear the term ‘older Australian’ in the media – how old do you think an ‘older Australian’ typically is? Question: And at what age would you say someone becomes ‘elderly’? Business ages collapsed to accommodate for smaller samples. Base: All respondents (Community, n=2,020), (18 – 34, n=175), (25 – 34 , n=436), (35 – 44, n=452), (45 – 54, n=448), (55 – 64, n=234), (65+, n=275) (Business, n=504) (18 – 34, n=225), (35 – 54, n=207), (55+, n=72). A/B/C/D/E/F: Significantly higher at the 95% confidence level. For these participants, ageing and old age are not simply defined by numeric age. Rather they are underpinned by deeper perceptions of self and associations with health, wellbeing, life-balance and social interaction. In contrast to older participants, younger people are more likely to see old age as a number. This is essentially someone who is older than 50. Not surprisingly, the concept of a shifting horizon of old age or ageing was not discussed in as much detail in the younger groups. However, some participants in their middle years (30-40 years) recognise that when they were younger (in their 20s) they would have perceived someone in their 40s as ‘old’. They indicate that as a result they would have projected some negative perceptions about ageing onto these individuals. The differing perspectives of old age and ageing are seen to create a tension, with younger people seeing older people differently to how older people see themselves. As a result, misconceptions, underpinned by differing definitions of old age, were commonly discussed in the focus groups and appear to be related to many of the stereotypes observed and much of the discriminatory behaviour experienced. Those classified as more likely to show predominantly negative behaviours (those who agree with four or more statements), are significantly more likely to feel that old age set in at a younger age than those who are not classified in this manner (a mean of 57.9 compared to 61.1 years). This difference is also seen in relation to those who hold predominantly negative attitudes (those who agree with 10 or more statements). 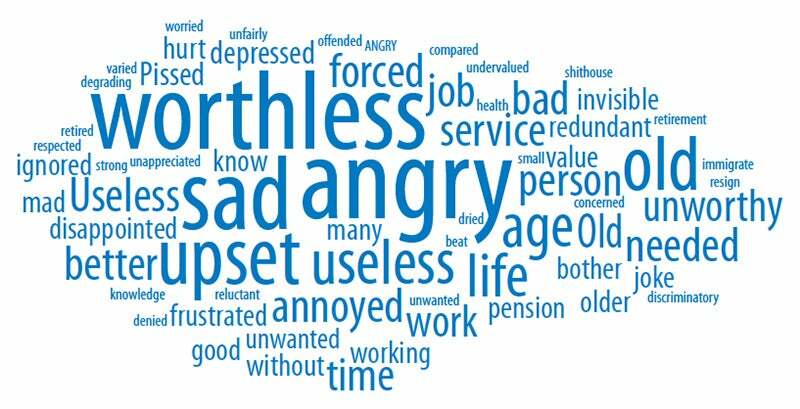 Business respondents who hold predominantly negative attitudes estimate old age to be significantly lower than those who are less likely to be classified in this manner. Business respondents who are reluctant to recruit above a certain age are significantly more likely to feel that old age set in at a lower age (58.3 years), compared to businesses who are not reluctant to hire above a certain age (63 years). The same pattern is observed in relation to perceptions of the age of an elderly Australian. All participants were also asked to indicate how common they feel age discrimination is in Australia. 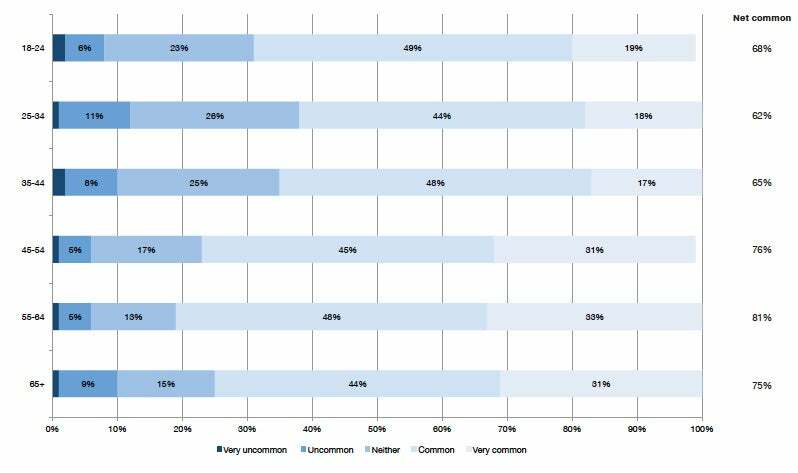 As shown in Figure 3, a majority of respondents (71%) feel that age discrimination in Australia is common (47% common, 24% very common). Findings for business respondents are consistent with the consumer sample (53% common and 18% very common). 75% of those age 65+ years. Experiences of discrimination peaked at 55-64 years, reflecting the negative impact of age-related discrimination in the workplace, as discussed in the focus groups. Question: How common or uncommon do you feel age discrimination is in Australia? Base: All respondents (Community, n=2,020), (18 – 34, n=175), (25 – 34, n=436), (35 – 44, n=452), (45 – 54, n=448), (55 – 64, n=234), (65+, n=275). from English speaking backgrounds (73%), when compared to those from non-English speaking backgrounds (57%). those aged 55+ years (77%). In addition, respondents classified as holding predominantly negative attitudes or as displaying predominantly negative behaviours are significantly less likely to feel that age discrimination is very common in Australia. Respondents were also asked to identify the locations where age discrimination was most likely to occur. Most community and business respondents feel that age discrimination is likely to occur in the workplace (88% community respondents, 92% business respondents). 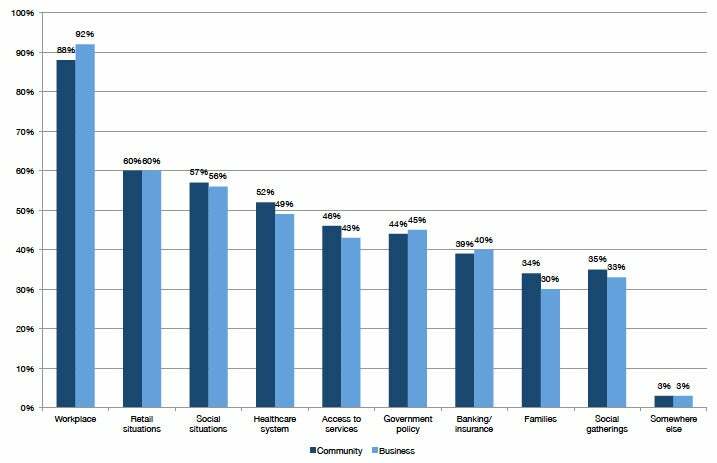 Retail situations are also commonly cited (60% business and 60% community) as are social situations (56% business and 57% community). Discrimination is also perceived to go beyond the scope of the community or business, with more than two in five reporting that discrimination is present within the healthcare system (52% community, 49% business), within government policy (44% community, 45% business) or in access to services (46% community, 43% business). Question: In what situations do you think age discrimination is most likely to occur? Base: All respondents indicating discrimination exists (Community, n=1,836), (Businesses, n=435). In general, perceptions about the commonality of discrimination in different locations, increases relative to the age of the respondent. The most significant differences between younger and older respondents are in relation to perceived discrimination within government policy, retail situations and access to banking and insurance products and services. Females are significantly more likely to feel that discrimination occurred in almost all situations, excluding government policy, the workplace or access to banking and insurance products and services. In the qualitative discussions, discrimination from financial institutions (for example, not being able to get a loan because of your age) is more often noted as an issue by males. However, when respondents were prompted, there appears to be no significant difference by gender. Respondents who had relationships with older people are significantly more likely to feel that discrimination occurred in the workplace, retail settings, within government policy and in relation to service access. Respondents from Queensland are significantly more likely to feel that age discrimination exists in the workplace (93%) compared to those in NSW (88%) or Victoria (86%). Those in regional areas (90%) are also more likely to feel that age discrimination exists in the workplace than those in metropolitan areas (87%). There are similar trends by age as those seen within the broader community sample. Females are significantly more likely than males to highlight age discrimination in social situations or within families. Respondents from businesses with 1-4 older staff are significantly more likely to see discrimination at the workplace or within government policy compared to respondents from large businesses (50+ older staff). Businesses which are less likely to encourage older applicants are significantly more likely to indicate discrimination occurring in the workplace (97%) compared to businesses which do not discourage older applicants (91%). Consistent with findings associated with the perceived degree of age discrimination in Australia, respondents who hold fewer negative attitudes (or engaged in less negative behaviour) are more likely to be aware of age discrimination in almost all settings. More than one third of respondents (38%) aged 55+ years have experienced age discrimination of some kind (35% of those aged 55-64 years and 43% of those aged 65+ years). The mean age at which this discrimination was experienced is at the lower end of the age cohort, at 56 years. The likelihood of being turned down from a position because of age is significantly higher among 55-64 year olds (67%) when compared to respondents aged 65+ (50%). Being ignored is more common among respondents living in a capital city (71%) when compared with respondents living in regional or rural areas (54%). 55-64 year old respondents (19%). In line with findings from the focus groups, older participants (particularly women) feel that retail settings are geared to the needs of younger consumers. This is despite the fact that the older market often has a greater degree of discretionary spending power. Question: And have you been...? Base: All respondents 55+ years who experienced discrimination (55 – 64, n=81), (65+ years, n=118). Relationship invisibility: Many report that they feel like they are a burden or feel forgotten or ignored because of issues associated with ageing. Participants feel that this is underpinned by stereotypical views about the physical abilities of older people and a lack of understanding about the diversity of interests that older people have. Others also feel that this form of invisibility is the result of programming or advertising decisions being made by younger people. Some people, particularly those from Melbourne, feel that younger people are in charge of programming and content and that these younger individuals are disengaged from the older audience. As a result, they do not see value in portraying older people beyond the more stereotypical roles of grandparent, carer or victim. For some older participants, this is of considerable concern, as they feel that younger people who may not have a family relationship with an older person rely on media and popular culture to gain an insight into the qualities of older Australians. While these participants appreciate offers of assistance, it is the tone with which this assistance is offered that is problematic. The main concerns centre on the tendency for younger people to simply assume that an older person cannot do something or take part in an activity – essentially passing judgement without asking. Being a source of amusement is also identified by some as a form of age-related discrimination. This is a complex issue, as the feeling of being discriminated against in this context depends on the relationship of the individual making a joke, the age of the person making a joke relative to the person being told the joke and the situation in which the joke is told. More important than age and relationship however, is the tone of the joke. If it is designed to be affectionate and inclusive, then most feel that this is simply part of the Australian culture. If it is designed to ridicule, belittle or bring someone down then it is classified as discriminatory. Respondents who had experienced age discrimination were asked to indicate how this makes them feel. The key themes are outlined in Figure 6. Among the predominantly negative responses, there are also a small number who laughed it off or said it was “water off a duck’s back”. Question: How did this make you feel? Importantly, respondents who thought the portrayal of older people in the media is a fair representation of the older population are significantly less likely to report having experienced discrimination.